At Noel's primary school, teachers and staff function as educators about as often as they do de facto social workers. 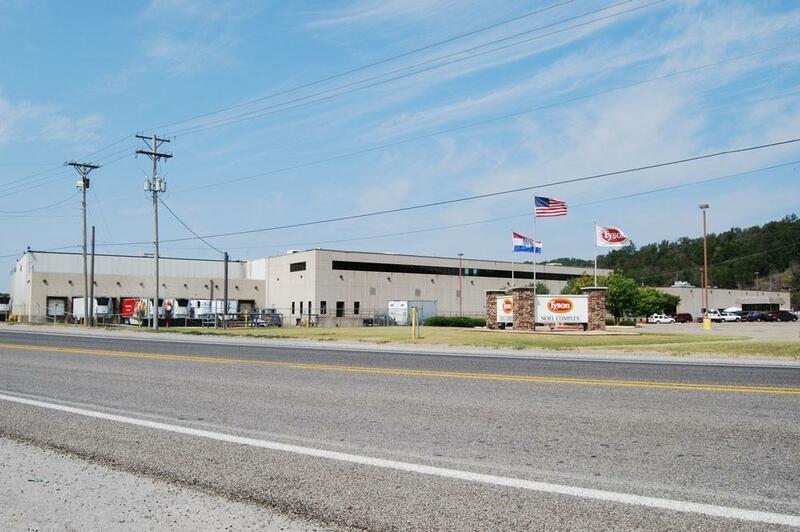 While Noel has been dubbed the "Christmas City" and "Canoe Capital of the Ozarks," it's actually the Tyson plant that is keeping Noel on the map. 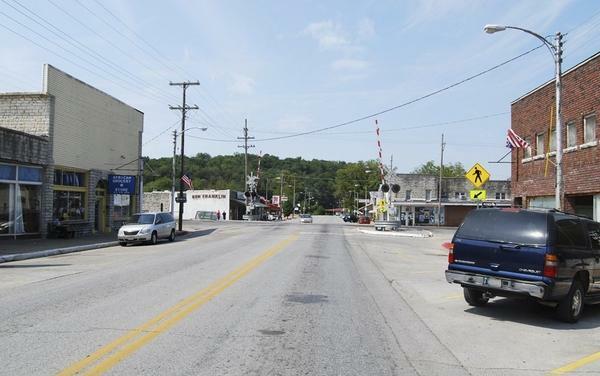 Noel, a remote Ozarks town of 1,832, is thriving thanks to the Tyson Foods poultry plant in town. This story comes to us from Harvest Public Media, a public radio reporting project that focuses on agriculture and food production issues. You can see more photos and hear more audio from the series here. Wednesday, we'll have a story from a meatpacking plant in Garden City, Kan., which takes a proactive stance toward its newest immigrants. For centuries, immigrants in search of a better life have been drawn to America's largest cities. 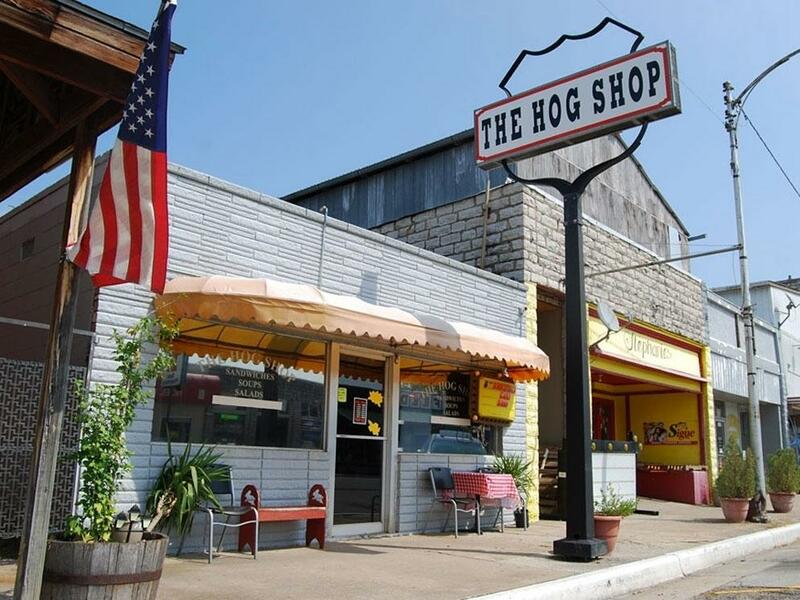 Now, in part because of the meatpacking industry, recent immigrants have been seeking out small, rural towns. But many of these towns are struggling to provide the social services needed by such a diverse population that's largely invisible to most Americans. Noel, Mo., has been dubbed the "Christmas City" and "Canoe Capital of the Ozarks" thanks to the Elk River, which winds through town. But this Missouri town of fewer than 2,000 residents thrives because of the Tyson Foods Inc. chicken processing complex located here — it alone employs about 1,600 people. Just 20 years ago, Noel had only about half as many residents, and most of them were white. Then in the 1990s, Hispanics — most of them Mexican — moved to Noel to process chicken. Pacific Islanders and refugees from parts of Myanmar and Africa followed. "We do have small towns that have had 100 to 200 percent growth that have really changed overnight over the past 20 years and have a much larger immigrant population than they used to," says Lisa Dorner, a University of Missouri education professor who has done extensive research on immigrant children growing up in small towns and suburbs. Dorner thinks such major demographic changes don't always sit well with local residents. "When you find yourself, as a family especially, in a place that is pretty remote and hasn't recently been used to welcoming immigrants, you may feel pretty lost," she says. For Somali newcomers, Noel has been particularly challenging. In a recent incident, tires on more than a dozen of their cars were recently slashed. Police didn't have a suspect and have since dropped the investigation. Some Somalis say they also feel unwelcome at local establishments. "Overall, this community, they are not welcoming to people [who] look different or [who are of] different religions. It's like they are still in the 1980s ..." says Farah Burale, a Somali-English translator at the Tyson plant. "Because of that reason, we are isolated, we see each other in the chicken plant or on the street without saying, 'Hi.' "
Affordable housing is also a problem here in Noel. There's a long waiting list for open units at the local housing authority. "You cannot rent a house right now. If you look, try to find a house, you can't," says Faisal Ali Ahmed, a Somali refugee who works the night shift at the Tyson plant as a forklift driver. "It's a very difficult life. If they shut down this company now, nobody stay in this bush. Even, I think, the people living [here] a long time. They cannot stay." John Lafley, the mayor of Noel, says longtime residents need to be sensitized to immigrants' needs, and immigrants need to try to fit in. "We're trying to assimilate people that don't understand the American way. And they want to keep their own ways, which is not that popular," Lafley says. Lafley says Tyson Foods is pushing the town to allow for more housing development, but he's concerned that Noel's infrastructure can't handle more units. "We're about at 80 percent right now with our sewer plant and so any more building would tax our sewage plant more," he says. The mayor says there's no money in the budget either to provide the social services needed in this small, remote town, which sits not far from the Missouri-Kansas-Arkansas-Oklahoma borders. For rural Missouri, Tyson plant jobs pay decent wages that start at $9.05 an hour. Still, poverty looms large here. About 90 percent of Noel school students qualify for free or reduced-cost meals. The number of homeless children has doubled in the past five years. Because the nearest food pantry and free clinic are miles away, many plant workers turn to their children's schools for help. "We are the government agency in town," says Noel Elementary School Principal Angie Brewer. "People come here if they need shoes, if they need clothes, if they're hungry. We send 37 backpacks home every weekend with kids that just don't have enough food." Brewer grew up in nearby Anderson and graduated from Noel High School in 1992. Back then, she remembers, the schools were all white. Now, 66 percent of Noel Elementary's students are minorities. About 11 languages — from Swahili to Pingelapese — are spoken here and almost half the school is Hispanic. Immigration issues, like parents being deported, have also become part of a typical school day here. "We have kids who are afraid because their parent has been stopped on their way to catch chickens and they are concerned that they will be deported," Brewer recalled. "Last year, we had three families come in the next day, their dad was gone in the night. They were taken off the chicken truck and their mothers were scared." Tyson says it takes its responsibility to the community seriously. The company has donated 40,000 pounds of meat to food banks in the area since 2000, and in August it donated $35,000 to help feed the school district's neediest families. Tyson's Burmese and Somali translators help enroll children in school. Brewer is grateful for the assistance but believes it's her teachers who really make the difference for these children. "No one's going to fall through a crack in Noel, Mo. It's not going to happen," she says. "Some of these are my own children's friends and these are my friends. They're real people and you're not reading about them on TV or hearing about them. They're people that I know. I've been to their house. I've sat on their couch. I've held their hand. They're real people and they deserve the best." Around dusk one night at the housing project next to Noel Elementary, half a dozen teenagers from Somalia, Ethiopia and Mexico played a pickup soccer game. One of them, a plucky 13-year-old named Mohamed Hassan, came to Noel two years ago from a refugee camp in Kenya. His parents work at the Tyson plant. Soon though, they may move to Kansas City for better jobs. "It's hard to work at Tyson. I can feel it," Hassan says. "Because if I meet somebody that is older than 25 or 26, they always say, like, they broke their finger, they hurt their finger, or like, they always say, 'I'm tired' or something like that. Everybody would like to move to a different job, except Tyson." Yet Hassan says he likes Noel: "When I first came, I didn't know any English. And now I do, a lot. I learned at this school and I am going say to them, 'Thank you for teaching me all that.' "
Tyson is hiring again and that means there will be soon be a new wave of immigrants for this 2-mile-square Missouri town in the heart of the Ozark Mountains to try to assimilate. For centuries, immigrants in search of a better life have been drawn to America's largest cities. Now, in part because of the meatpacking industry, recent immigrants are seeking out small, rural towns. And many of these towns are now struggling to provide the social services needed by such a diverse population. From Noel, Missouri, Abbie Fentress Swanson reports. ABBIE FENTRESS SWANSON, BYLINE: Noel, Missouri has been dubbed the canoe capital of the Ozarks. But this town of fewer than 2,000 residents thrives, because of the Tyson Foods chicken plant located here. It alone employs 1,600 people. Just 20 years ago, Noel only had about half as many residents and most of them were white. Then in the '90s, Hispanics, mainly Mexicans, moved to Noel to process chicken. Pacific Islanders and refugees from parts of Africa and Myanmar followed. LISA DORNER: We do have small towns that have had 100, 200 percent growth that have really changed overnight over the past 20 years, and have a much larger immigrant population than they used to. SWANSON: University of Missouri Education Professor Lisa Dorner says such major demographic changes don't always sit well with local residents. For Somali newcomers, Noel has been particularly challenging. In a recent incident, tires on a dozen of their cars were slashed and some Somalis, like Farah Burale, feel isolated and unwelcome. FARAH BURALE: Overall, this community, they are not welcoming to people looking different. Because of that reason we are isolated. We see each other in the chicken plant or just on the street, without saying Hi. SWANSON: Faisal Ali Ahmed works the night shift driving a forklift at the Tyson plant and has struggled to find housing in Noel. FAISAL ALI AHMED: If they shut down this company now, nobody stay (unintelligible). Even, I think, the people living a long time, they cannot stay. SWANSON: John Lafley is the mayor of Noel. He says long-time residents need to be sensitized to immigrants' needs and immigrants need to try to fit in. MAYOR JOHN LAFLEY: We're trying to assimilate people that don't understand the American way, I should say. And they want to keep their own ways which is, you know, not seeing that unpopular. SWANSON: Lafley says Tyson is pushing for more housing. But he's concerned about the town's infrastructure. LAFLEY: We're about at 80 percent right now with our sewer plant. And so, any more building would tax our sewage plant more. SWANSON: The mayor says there's no money in the budget to provide the social services needed in this small, remote town. The nearest food pantry and free clinic are miles away. So many plant workers turn to their children's schools for help. ROD: My name is Rod. ERIN MCPHERSON: I'd Rod. How do we spell Rod? MCPHERSON: R-O-D, right? No silent e on the end. Very good, go ahead and fill that in. SWANSON: At Noel Primary School this morning some, Hispanic students are completing English language exercises. Not Isac Martinez. 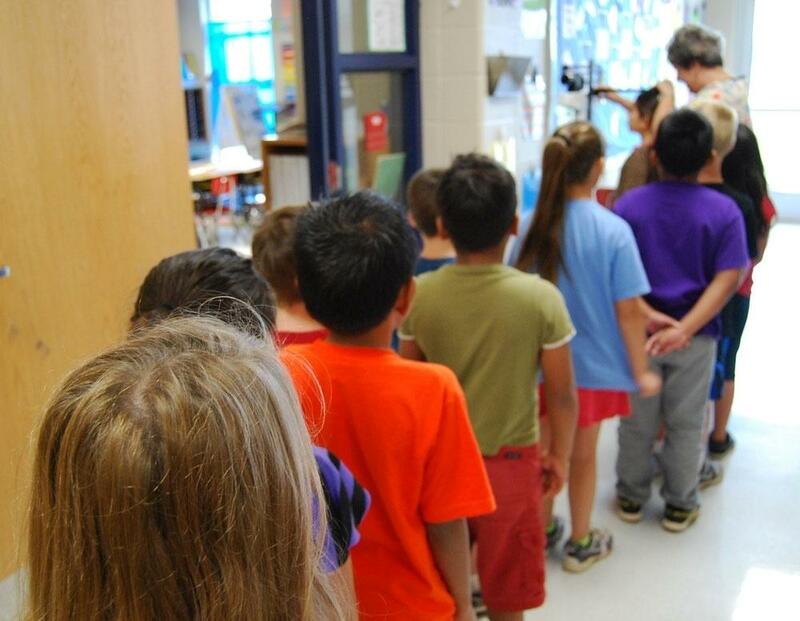 Teacher Erin McPherson asks the 9-year-old, what's wrong? ISAC MARTINEZ: I threw up yesterday. MCPHERSON: You threw up last night? You go to the doctor? SWANSON: As is often the case here, the teacher is part social worker. Tyson wages start at $9.05 an hour, so about 90 percent of Noel students qualify for free or reduced cost meals. That makes the schools the safety net for children whose parents work at the plant. ANGIE BREWER: We are the government agency in town. SWANSON: Noel Elementary School Principal Angie Brewer. BREWER: People come here if they need shoes, if they need clothes, if they're hungry. We send 37 backpacks home every weekend with kids that just don't have enough food. SWANSON: Immigration issues, like parents being deported, have also become part of a typical school day here. BREWER: We have actually had, last year, we had three families come in the next day - their dad was gone in the night. SWANSON: When she became principal three years ago, Angie Brewer reached out to Tyson for additional assistance to help feed her neediest families. BREWER: Some of these they're my own children's brand and these are my brands. You know? They're real people and they deserve the best. SWANSON: At the housing project next to Noel Elementary, a 13-year-old Somali refugee named Mohamed Hassan is playing soccer with friends. His parents moved here two years ago to work at Tyson. And Hassan says he likes Noel. MOHAMED HASSAN: When I first came, I didn't know any English. And now I do a lot. I learned at this school and I am going to say to them thank you. SWANSON: Tyson is hiring again and that means there will be soon be a new wave of immigrants for this small Missouri town to try to assimilate. For NPR News, I'm Abbie Fentress Swanson in Noel, Missouri. BLOCK: And that story came to us from Harvest Public Media, a Public Radio reporting project that focuses on agriculture and food production issues. Tomorrow: A story from the meatpacking plant of Garden City, Kansas, which takes a more proactive approach as it welcomes new immigrants. Transcript provided by NPR, Copyright NPR.